Froggy's Fiber Followings: Felting Fun? Today I opened up my long ago purchased Clover Needlefelting Tool and tried some needle felting on a large scale. This obviously isn't the greatest thing in the world but it is something. I made it as part of the February EtsyFAST Challenge. 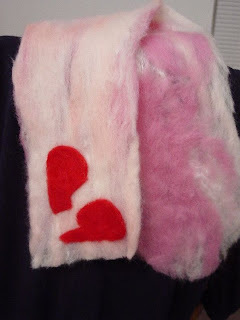 The long and short of it is a "scarflet" made of a light pink dyed roving on one side and dark pink on the other side. Smooshed in between was bombyx silk. I cut the edges to try to give it some shape and I added a needlefelted heart. 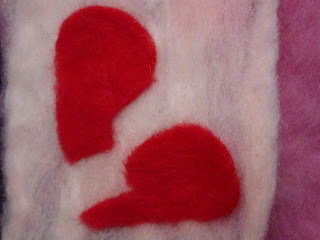 The heart was felted separately, cut and needle felted onto the scarflet. The theme is "Anti-Valentines." It may be slightly obvious that I'm totally a newbie at this. I feel like every other word is "needle," "felting," or "needlefelting." Next time I'm going for a thesaurus.